Sometimes life can seem too hard to bear. When this happens we need to be comforted - to receive a gentle hug, comforting words, a helping hand, or other supportive actions. 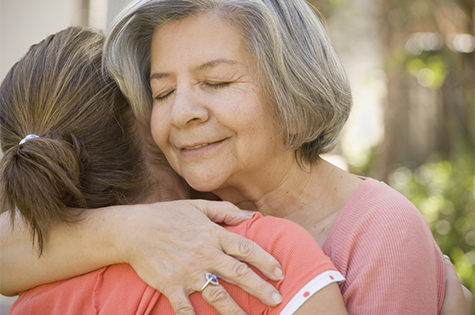 Such compassionate and thoughtful attention can lessen grief, make distress seem lighter, and bring healing relief. These tender outcomes demonstrate how allowing yourself to be comforted, or giving comfort to someone else, is beneficial, and therefore is good for your health. Humbly accept someone’s gift of caring. Comfort is love. It’s a spiritual quality that soothes hurt and brings peace. Never be too proud to be comforted by others. If you’re alone. Don’t feel comfortless. There‘s a divine Love always present with you. And just like a mother, that Love is supporting, comforting and strengthening you, now and always. Comfort your children. In times of tragedy remind them that good is always present. Fred Rogers, a popular American children's TV show host, relates how as a boy when he saw scary things in the news, his mother would say to him, “Look for the helpers. You will always find people who are helping”. To this day, especially in times of disaster, he says, “I remember my mother’s words, and I’m always comforted by realizing that there are still so many helpers — so many caring people in this world." Be brave. Put aside any doubts. Do what you can to lessen someone’s sorrow. Don’t hold back. No matter how small or simple you think your words or actions are, be assured that if they come from your heart, they will be just right. You can be comforted and comforting. It’s good for your health. He been successful in providing a lot relief as well as helped me to maintain my personal active physical activities as well as postpone surgical treatment. About Boston - He was very professional and comprehensive in his prognosis and coverings which also included diet plan suggestions to enhance my personal knee problem in accessory for my personal your overall wellness.